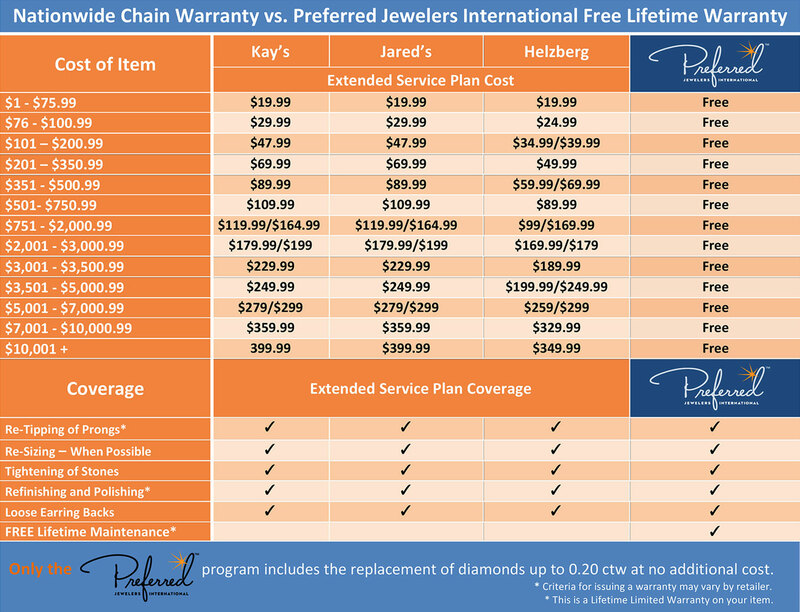 Preferred Jewelers International™ is a nationwide network of premier independently owned and operated jewelry stores. Thorough inspection of all prongs, channel and setting work to assure none of the stones move in any way. Re-tipping is the process of adding small amounts of metal to the tip of each prong. Stones do not have to be removed. *In the instances where Rhodium is required, a charge MAY be incurred. This is at the sole discretion of the Preferred Jeweler. After the initial sizing of your ring at purchase, when possible a Preferred Jeweler will provide lifetime re-sizing of your ring. Some rings are not sizable, especially if there is a large size difference or if it will compromise the integrity of your ring. Preferred recommends and requires that you come in to your Preferred retailer to have your items inspected every 6 months so that we can check for any loose stones and perform the necessary repairs. Any scratches and or scuffs will be polished. Some finishes can’t be restored especially specialty designer finishes. Steam, ultrasonic cleaning and polishing machines are used to bring your jewelry to pristine condition. *In the instances where Rhodium is required, a charge MAY be incurred. This is at the sole discretion of the Preferred Jeweler. Your earring backs will be repaired and or replaced if they are no longer secure. will replace a diamond up to .20ctw at no additional charge to consumer. Excluding Fancy Color Diamonds. Your item must be in perfect like new or new condition to be eligible for the Preferred Warranty. To keep your warranty valid, you are required to visit your Preferred Jeweler every 6 months to have your items inspected and maintained. Your visit will be notated in the Preferred website data base. Customer and retailer will be notified by email 30 days before and again 14 days before “due date” inspection, with one more courtesy email 15 days after if not updated yet. Having work done on your item out of the Preferred Network can void your warranty unless authorized by Preferred Headquarters. Please ensure that we have a valid email address on file. Should there be a lapse in time and your warranty has become invalid the retailer may then charge the customer to bring the item back into warrantable condition and then reinstate the warranty. *Criteria for issuing a warranty varies by retailer. Criteria for issuing a warranty may vary by retailer. Retailer has the option to apply for a RA Number and have the item sent in to the Preferred Facilitator “True Romance” to implement service covered under the Preferred Nationwide Warranty. Where can I have my jewelry serviced if I move? Moving? Don't worry about sending your jewelry back to your Preferred Jeweler to be serviced or finding that same excellent service in your new city. Just click on the tab titled Nationwide Presence on our website to locate the nearest Preferred retailer in your new town. They will be happy to help you maintain the beauty and longevity of your jewelry. What happens if I move to a new location with no Preferred Jeweler near me? If you happen to move to a new location where there is no Preferred Jeweler near you and you need service, please contact the Preferred national headquarters. Our toll free number is 888-998-8874 and we will advise you on how to proceed. The Nationwide Warranty covers the replacement of any missing diamonds from the setting up to 0.20 ctw. If you lose a diamond, take your item into the nearest Preferred Jeweler with your warranty card. They will be able to track your jewelry in our system to see where it was originally purchased. The proper steps will be taken in order to assure that your jewelry is repaired. What Happens if your item has withstood major duress, for example if it has been slammed in a door. Is it still eligible for free repairs under the warranty? Any kind of personal accidental damage to your jewelry would not be covered under the Preferred Warranty ... the warranty states clearly what is covered and hence the requirement for the semi annual inspection to keep your piece in warrantable condition. If this should occur the retailer will charge you to get your jewelry back in warrantable condition and then reinstate the warranty. Insurance coverage is highly recommended.